Click on Ad image for service details. to fix your Computer and Networking Problems. E-mail DialANerd@verizon.net for free answers to your questions! Credit card payment methods are described here. DialANerd charges $1 per minute or $60 per hour for on-line service with no minimum, a free troubleshooting assessment with a not to exceed service charge of $250 including a 60 day no questions asked warranty for in-shop service and a $2 per minute or $120 per hour for on-site service with no minimum charge and a not to exceed limit of $480. Dial A Nerd, a local MD small business performs in home computer repair, PC repair, laptop repair, Virus removal, SOHO network repair, Windows XP and Vista repair, web site development, and more. 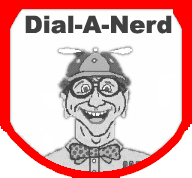 Dial-A-Nerd is can be contacted 24 hours a day 7 days a week. DialANerd performs immediate remote access service, onsite hourly rate repairs, as well as has repair shop fixed price service for drop off and pick up computers at our repair shop located in Columbia Howard County MD. Repair completion turn around is typically 24-hours to 48-hours. At Dial A Nerd we save your data. We test your disk for errors every time a computer is serviced. We are able to save disk data in about a 90% of the PCs serviced. 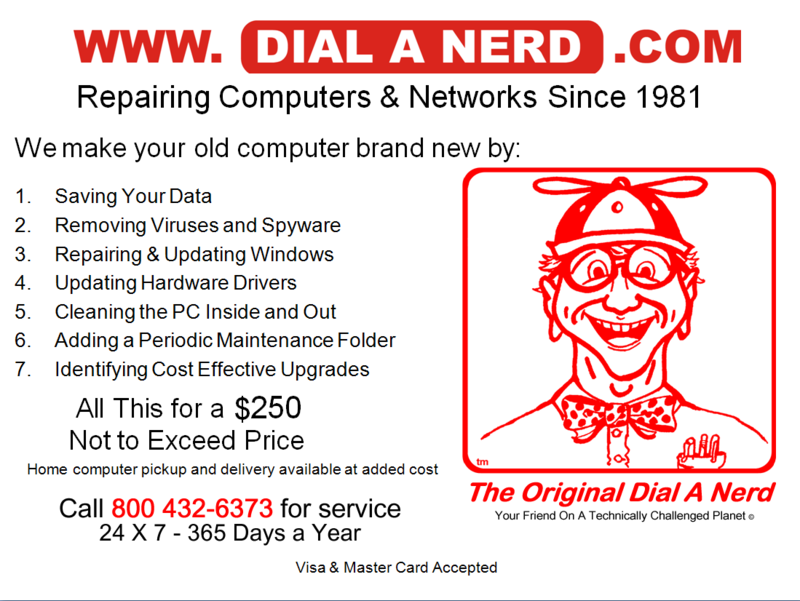 Dial A Nerd, a local Columbia Howard County Maryland computer repair business, gives you faster service and better customer support than any Geek or other franchise PC repair companies. Contact us your business IT service solution. Dial A Nerd works on many types of PCs including Sony, Gateway, Hewlett Packard, Compaq, Toshiba, Emachines, Clone PCs, and Dell computers in Columbia, Ellicott City, Howard County and many other Maryland locations. The Dial A Nerd mission is to provide the best quality, affordable cost effective computer repair; home and on-site PC support; virus removal; printer support; SOHO network - wireless network repair and troubleshooting; web site design, promotion, and optimization; and user one on one training services. Homes and small businesses operating with limited IT services and IT support budget hire Dial A Nerd because of their 25 yrs home and office onsite computer repair, maintenance, support, troubleshooting, fixing, and upgrading experience; constant virus and spyware removal experience; their data recovery saving your data experience and tools; and their website development experience working on desktop, laptop, Windows XP and Windows Vista computers. Hiring Dial A Nerd, a local Columbia Howard County Maryland small business, brings their 25 yrs home and office onsite computer repair, maintenance, support, troubleshooting, fixing, and upgrading experience; constant virus and spyware removal experience; their data recovery saving your data experience and tools; and their website development experience working on desktop, laptop, Windows XP and Windows Vista computers to solving your computer repair or Windows repair, or wired or wireless network repair problem. ï¿½ 2004-2011 by P. D. Moulton. All rights reserved.